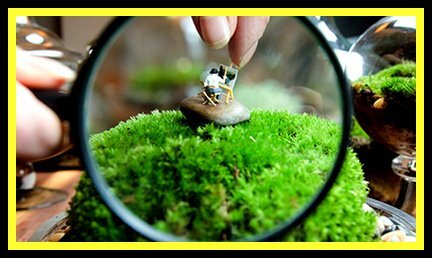 ** A terrarium is like a little garden that is made inside a glass container. 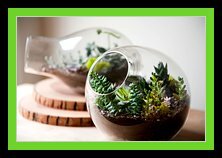 **Another good thing about this craft project, a terrarium can be placed on a night stand, a desk, or any location that you would like to add some beauty and tranquility. As "they" always say, "Everything comes back into style, if you just wait long enough". These tiny gardens fall into this catagory. I remember back in college when my roommate and I had three or four in our apartment. We were so "cool" and didn't even know it. A terrarium is like a little garden that is made inside a glass enclosure. They require very little work and very little time. If you are normally a plant killer, this will be just the thing for you. There are a lot of plants that you can use and the container can be just about any size. These mini gardens are fun because you are able to bring a bit of the outdoors, indoors. Another good point is that they can be placed on a night stand, a desk, or any location that you would like to add some beauty and tranquility. If you are interested in creating one of these small works of art, then, get ready, get set, and GO!!! 7. Next, take your plants out of there pots and remove as much soil from the roots without harming the roots. 8. Place the plants in the potting soil and arrange them the way you like them. 9. Now you can add your decorations like shells, rocks, small animals, marbles, or anything that you would like. "Voila", you have a work of art. An attractive piece of "whimsical garden art" that you can keep in your home or office. Terrariums make nice gifts for Mothers Day, house-warmings, birthdays or any occasion. The recipient will love you for it, not only because it's beautiful, but because you made it. For those of us who need visuals, I have included a video from you-tube. Do You Have a "Special Picture" That You Would Like to Share? Do you have a special picture that you would like to share with us? I sure hope so. We want to see your artistic side. I know that when my daugter was young, we would hang her art work on the fridge. Of course only the family and a few friends would ever get to see it. Now, with the internet, you can share your extraordinary talent with kids all over the world. Tell us all about your picture and what you like about making art. Your story will appear on our Web page exactly the way you enter it here. Do you have your picture all ready? Great! Click the button and find it on your computer. Then select it.